Country Picnic Salad: Combine Bean Salad with thinly sliced green onions, bell pepper and cucumber, halved cherry tomatoes, fresh herbs and cooked rotini pasta. Bean & Feta Mediterranean Salad: Add sliced black olives, chopped tomatoes, bell pepper strips, sliced red onion, fresh herbs and crumbled feta cheese to Bean Salad. Bean Salad Picnic Sandwich: Split crusty baguette lengthwise. Layer spinach leaves, drained Bean Salad, sliced Swiss cheese and sliced deli ham or turkey on bottom half of baguette. Close sandwich. Wrap tightly in aluminum foil or plastic wrap and refrigerate to allow flavors to blend. Cut into serving size pieces. 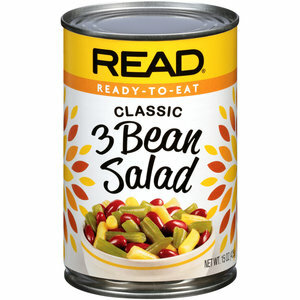 Bean Chopped Salad: Drain Bean Salad. Toss with chopped romaine or iceberg lettuce, bite-size pieces cooked chicken, crumbled bacon (optional), chopped cucumber, tomato and bell pepper, and strips of Swiss or Cheddar cheese. Toss with favorite vinaigrette. German Potato Salad & Sausage: Add cooked smoked sausage cut into diagonal slices, thinly sliced green onions and chopped green bell pepper to German Potato Salad; heat through. Sprinkle with chopped fresh tomato. German Potato Salad Skillet: Add precooked bite-size pieces of sausage, chicken or ham, sautéed onions and mushrooms to German Potato Salad; heat through.